"I tell you I cannot bear it! I shall do something desperate if this life is not changed soon. It gets worse and worse, and I often feel as if I'd gladly sell my soul to Satan for a year of freedom." Summary: So speaks Rosamond Vivian, the heroine of our little tragedy. Ahwhe has been raised by a grandfather who does not really love her, and, as it turns out, is only raising her because a fortune is coming her way. She's a goodhearted girl, but it is unsurprising that when Phillip Tempest shows up, she can't help but see freedom in this handsome man with a dashing scar, a yacht, and infinitely more experience of the world than she has. After sounding her out a bit, Tempest essentially kidnaps her. She insists at first on being taken back, but when he produces a parson and asks her to marry her -- well, the option is going back to her grandfather, and she has certainly had a more interesting time with Tempest than she has ever had before. So she gets her year of freedom. But Tempest is her Mephistopheles -- that was originally title of the book, A Modern Mephistopheles: or The Fatal Love Chase, it is remarked early on that he even looks like a picture of Mephistopheles -- and her bargain was a Faustian one. Her freedom was the illusion of freedom in a cage of gold, and except for the friendship of Ippolito, Tempest's servant boy, she in reality gains nothing from her deal with the devil. When she discovers this, she flees from Tempest and his extraordinarily resourceful servant Baptiste; but Tempest is not a man to give up a possession and pursues her all over Europe. Her only advantage is a knack for making good friends -- first Ippolito, then Honorine the actress, then, most important of all, Father Ignatius, who becomes her protector. The book was deliberately written to have a major upheaval and cliffhanger every second chapter, so that's about as much as can be said without giving away massive amounts of plot -- it's very difficult to summarize a plot built almost entirely on the principle of surprise. For all that, the story does not lose its coherence. The actions of the characters are plausible and 'in character' throughout, and we see in the title itself that there is a looming destination. There are a number of striking features to the book. The characterization is excellent -- this is some of Alcott's best character-work. The book exhibits throughout Alcott's consistent authorial quirk of allegorizing characters in the middle of telling the story; and her literary allusions are all quite explicit, as they are in her other works. They are often less obvious here, however, because they take a backseat to the constant twists of action and while it would be impossible to miss many of the Faust allusions, one might not immediately recognize how much of Shakespeare's The Tempest is in the book. For a novel written by a non-Catholic in the 1860's, it is striking to have a hero like Father Ignatius, the Catholic priest, whose celibacy is portrayed not (as so often in Protestant works of the period) as unnatural but as something noble and even uplifting. One of the things that I've never seen remarked -- although I don't read a vast amount of Alcott scholarship -- is the recurring symbol of the rosary in Alcott's works. I know of at least three distinct works by Alcott in which the rosary shows up in a favorable light -- Little Women, this work, and A Modern Mephistopheles -- despite Alcott indicating clearly in each case that she doesn't hold the Catholic view of it. And Catholics associated with it, like Esther in Little Women or Father Ignatius here, are also presented very positively. It's a symbolism that might be worth looking into. Alcott wrote two Faust stories, of which this, the first, was not published in her lifetime. The second was published in her lifetime, although anonymously; it stole its title from this work, and was published under the title A Modern Mephistopheles. The works are very different -- Rosamond, personality-wise, is a very different person from Felix Canaris, although they are both Faust, and while Felix has Gladys to play Gretchen, Rosamond plays Gretchen as well as Faust. Further, A Long Fatal Love Chase is all action, while A Modern Mephistopheles has very minimal action. Most interesting, however, is the contrast between the two figures playing Mephistopheles, Phillip Tempest and Jasper Helwyze. Tempest is a dashing man of action who never stops moving. Helwyze is a bookish invalid who is slowly becoming paralyzed. Tempest has inherited his Mephistophelean character by blood and upbringing; he even has a physical resemblance. Helwyze is playing Mephistopheles; he is quite literally copying Goethe's character, and translating those actions into new circumstances. Tempest is Mephistopheles almost despite himself; Helwyze deliberately and explicitly aspires to be Mephistopheles. Both men are predators, but Tempest seeks to possess while Helwyze seeks to corrupt. They present two different ways you could see the devil: as something that can pursue you to the ends of the earth and show up just when you've thought you've finally lost it, like some cunning lion, or something that, spider-like, sits at the center of the web in which the fly catches itself. The lure of the Tempest-like devil is freedom, but your freedom turns out to be the novelty (for a while) of a new kind of slavery or imprisonment. The lure of the Helwyze-like devil is success, but your success turns out to be empty plagiarism that gives you the externals of success without any of the substance. Alcott can tell you a lot about how human beings fall into darkness. But Alcott also insists on the hope of escape. Both Rosamond Vivian and Felix Canaris escape Mephistopheles, as Faust escaped Mephistopheles. It is not the escape one would have though, or could have hoped; but the devil can only promise happiness, whether in the form of freedom, or success, or any other form, because happiness is something human beings can actually achieve. All temptation is merely a trap built by twisting that in us which tends toward it. Ensnared by that temptation, we have guaranteed a tragic end -- but the tragic end may bring as well the first true glimpse of what happiness actually is. In a true Faust story, there is a power making it possible for us to rise above the temptation that snares us, and the devil's own machinations can bring us to the first steps on the way to salvation. Tempest needed one more lesson and he received it when Ignatius turned on him a face full of love and longing, full of a man's dearest and strongest passion, yet answered steadily though his cheek paled and his eye darkened with intensity of feeling, "I shall love her all my life, shall be to her a faithful friend, and if I cannot remain loyal to both God and her I shall renounce her and never see her face again. You call this folly; to me it is a hard duty, and the more I love her the worthier of her will I endeavor to become by my own integrity of soul." Recommendation: It is not as timeless as Alcott's better known works, but Alcott quite clearly has a lot more fun writing in the 'lurid' style. The characters are interesting, the plot never palls, and if you ever start reading it you will find yourself carried along by it in a rush. Highly recommended. Quotations from: Louisa May Alcott, A Long Fatal Love Chase. Dell (New York: 1995). O then we learn the time is spring! 'Tis then we know that summer's come! Joyous we say, the autumn's near! Ah then! cold winter's breath we feel! Ella Fitzgerald, "The Old Rugged Cross". The First Lady of Song was born on April 25, 1917. This version of an old classic is from her underappreciated later body of work, when she had been dropped by MGM and was experimenting beyond the bounds that made her famous. I think it, solemn yet almost bursting with joy, shows one of her truly great talents: to capture just the right mood for a song. If I myself see a man walk on the ice, it is past probability; it is knowledge. But if another tells me he saw a man in England, in the midst of a sharp winter, walk upon water hardened with cold, this has so great conformity with what is usually observed to happen that I am disposed by the nature of the thing itself to assent to it; unless some manifest suspicion attend the relation of that matter of fact. But if the same thing be told to one born between the tropics, who never saw nor heard of any such thing before, there the whole probability relies on testimony: and as the relators are more in number, and of more credit, and have no interest to speak contrary to the truth, so that matter of fact is like to find more or less belief. Though to a man whose experience has always been quite contrary, and who has never heard of anything like it, the most untainted credit of a witness will scarce be able to find belief. As it happened to a Dutch ambassador, who entertaining the king of Siam with the particularities of Holland, which he was inquisitive after, amongst other things told him that the water in his country would sometimes, in cold weather, be so hard that men walked upon it, and that it would bear an elephant, if he were there. To which the king replied, Hitherto I have believed the strange things you have told me, because I look upon you as a sober fair man, but now I am sure you lie. Taking the observation therefore in this sense, the proposition is this: that the testimony of others ought not to be admitted, but in such matters as probable, or at least possible, to our opinion. For instance: a man who lives in a warm climate, and never saw ice, ought upon no evidence believe that rivers freeze and grow hard in cold countries: for this is improbable, contrary to the usual course of nature; and impossible according to his notion of things. And yet we all know that this is a plain, manifest case, discernible by the senses of men, of which therefore they are qualified to be good witnesses. So, likewise, the rule and measure of our hopes and fears concerning he success of our pursuits; our expectations that others will ct so and so in such circumstances; and our judgment that such actions proceed from such principles;—all these rely upon our having observed the like to what we hope, fear, expect, judge; I say, upon our having observed the like, either with respect to others or ourselves. And thus, whereas the prince,* who had always lived in a warm climate, naturally concluded in the way of analogy, that there was no such thing as water becoming hard, because he had always observed it to be fluid and yielding: we, on the contrary, from analogy, conclude, that there is no presumption at all against this; that it is supposable there may be frost in England any given day in January next; probable, that there will on some day of the month; and that there is a moral certainty, that is, ground for an expectation, without any doubt of it, in some part or other of the winter. Yet this Author intimates plainly enough, that very strong Testimony might justly have engaged the Prince's Assent to these Accounts of the Effects of Frost: For though they were not conformable to his Experience, yet they were not contrary to it. The last Expression, as it came from Mr. Hume, has, indeed, a little different Turn, but is, in effect, the same with this. And his Observation is certainly right; for the Prince neither had had, nor could have, any Experience that Water could not be frozen to Solidity. All that his Experience amounted to, was, that Water had never been actually solid, within his Knowledge or Observation; but this was no Proof from Experience that it could not ever have been so. There was no Experience in this Case that could be Opposed to the Experience for the Credibility of human Testimony. And therefore such Testimony, when strong, as it ought to be, in Proportion to the extraordinary Nature of the Fact related, must have remained in its full genuine Force, and was therefore justly credible, and capable of rendering the Fact related credible to the Prince. Now as Mr. Hume saw the Justness of this Reasoning in the Case before us, so he ought to have seen it, with regard to the Credibility of Miracles upon sufficient human Testimony. For the Reasoning is exactly the same in both. There is no more Experience to any one against Miracles, than there was to the Indian Prince against the Effects of Frost. And since there is no such Experience to be Opposed to that Experience, upon which the Credibility of human Testimony is grounded, that Testimony ought to have its full Force in the Proof of Miracles, as well as of any other Events. There may be no perfect analogy in nature, unless it be that there arise exceptions to hitherto universal experience in all classes of things, with which we are acquainted. The tale of the Indian Prince, who refused to believe a natural occurrence which passed the limits of his own experience, may be told of ourselves ; — we deem some limited observation we make, the measure of an universal fact; — we draw general conclusions from particular premises ; until extended knowledge acquaints us with exceptions, and sometimes with single and most important exceptions to otherwise universal facts. I was always a lover of ladies' hands! Note that the harm principle applies to 'compulsion and control' generally; Mill does not restrict it to government action. It would include acts like voluntary public shaming and shunning. In modern Western societies there are currently no major political groups that accept this principle. Conservatives have historically either not accepted it or only accepted it with major qualifications. It is inconsistent with typical Socialist or Green-style progressivist politics. Liberals do not generally seem to accept it. Even Libertarians, who do affirm a harm principle, only do so for government. It is really remarkable, actually, that Mill's harm principle keeps popping up in more abstract discussions of politics and in political philosophy given that everybody these days seems to think it obviously wrong. This is one possible account of the right to free speech (one historically associated with libertarians in particular); it would not be a Millian or classical liberal account. This is somewhat interesting because there's an argument to be made that historically the right to free speech was often understood in broadly Millian terms: the arguments that guided how one understood the right to free speech in the government case were in reality more general principles about freedom of speech that did not exclude 'moral coercion' like bans, and so forth. 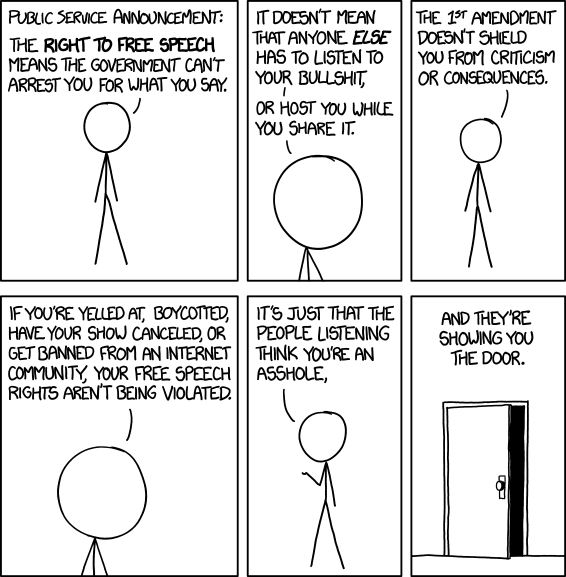 What's more, it's not difficult to find people still understanding the right to free speech in this way, even if they are not consistent: the political self-expression movement, for instance, tends not to make sharp distinctions between what the government is doing and what society as a whole is doing to interfere with political self-expression, and it's not difficult in the United States to find people who will claim that such coercive measures are contrary at least to the spirit and principle of the First Amendment even if not strictly contrary to the letter of that law. One way one could interpret this is as the fading residue and remnant of the earlier understanding. If this is in fact the case, it would be interesting to look at the history of the collapse of the Millian approach to free speech and what factors were involved. Of course, as I noted in the previous post, Mill's liberalism was itself an innovation, so perhaps we're really getting the dominance of an idea that was always there, and that it's really more a story of this idea slowly pushing classical liberalism even out of the honorary position of receiving lip service that it had through the influence of Mill. Any number of other things could be going on, too, of course. William James's essay, "The Will to Believe", is widely read by philosophers, but one thing that I have never seen anyone remark upon is the relation of the essay to the work of James Fitzjames Stephen. Nonetheless, there is good reason to explore the relation, not least because James opens the essay with an anecdote about Fitzjames Stephen and closes with a quotation from Stephen's Liberty, Equality, and Fraternity, which is an attack on Mill's On Liberty. Like Mill, Stephen was a utilitarian. Like Mill, he was a liberal. Unlike Mill, he was what would have been at the time a more typical representative of both. It can be difficult for modern philosophers to put themselves back into that frame of reference, but it really is quite important for understanding both. Mill's On Liberty may be a standard text of what we call classical liberalism, but many liberals in his day considered it to be a dubious contribution to liberalism. And the reverse is also true; James Stephen often gets branded as a conservative, but he was a reformer and liberal through and through -- he just thought that Mill's version of liberalism was incoherent and that it cut off too many of the means by which genuine reforms could be furthered. This is precisely what Liberty, Equality, and Fraternity is: an argument that a coherent liberalism involves the use of means that Mill's ideas ruled out of court. In particular, he argues that genuine reform requires the use of government force in the interests of morality and religion, and that it is not only undesirable but impossible to regulate a nation and maintain it on a path of progress entirely by free discussion, with coercion only being used to stop or remedy definite cases of harm. One of the things that Stephen considers problematic about Mill's account is that his restriction of coercion (not just government coercion but also the coercion of public opinion) amounts to an insistence that certain kinds of passions -- like fears -- should not be part of one's system of governance. This would have been very high on Stephen's list of concerns; when he wrote Liberty, Equality, and Fraternity, he was traveling back from India, where he had been on the Colonial Council and had been working on drafting laws to reduce the power of the caste system -- for instance, he was responsible for new rules of evidence according to which there was only one standard of evidence for everyone, regardless of caste or religion. While Mill very carefully formulates his harm principle so that it does not directly interfere with colonial policies (a fact usually overlooked in discussions of On Liberty), people like Stephen did not see themselves as doing in India anything other than the same kind of thing that utilitarian and liberal reformers were doing in Britain itself -- they were just at a different stage of progress. Stephen considers Mill's restriction of compulsion to be both detrimental to progress and inconsistent with human nature. Human beings, when deeply interested, as in cases of morality or religion, are drawn to the insistence that everybody should be on board with whatever moral or religious principle they are deeply interested in; it is not possible, in the statistical main, to have a society in which this has no effect whatsoever. This is not purely restricted to moral and religious matters, although those are the ones with which Stephen is primarily concerned; Stephen notes the acrimony that builds up in fairly abstract disputes and takes it to be the sign of an obvious fact, that we are not, and are not capable of being, purely neutral, however much we might try to hide it. Feelings occupy a great deal of our decisions and reasoning. What do you think of yourself? What do you think of the world?...These are questions with which all must deal as it seems good to them. They are riddles of the Sphinx, and in some way or other we must deal with them. . . . In all important transactions of life we have to take a leap in the dark....If we decide to leave the riddles unanswered, that is a choice; if we waver in our answer, that, too, is a choice: but whatever choice we make, we make it at our peril. If a man chooses to turn his back altogether on God and the future, no one can prevent him; no one can show beyond reasonable doubt that he is mistaken. If a man thinks otherwise and acts as he thinks, I do not see that any one can prove that he is mistaken. Each must act as he thinks best; and if he is wrong, so much the worse for him. We stand on a mountain pass in the midst of whirling snow and blinding mist through which we get glimpses now and then of paths which may be deceptive. If we stand still we shall be frozen to death. If we take the wrong road we shall be dashed to pieces. We do not certainly know whether there is any right one. What must we do? ' Be strong and of a good courage.' Act for the best, hope for the best, and take what comes....If death ends all, we cannot meet death better. James, of course, is not committed to Stephen's broader ethical and political views, just as Stephen is not committed to James's own ideas. There are certainly aspects of thought that James shares more with Mill than Stephen. But it's impossible not to recognize that Stephen's attack on Millian liberalism has broad resemblances to James's attack on Cliffordian ethics of belief. They both deny that the matters in question -- politics in the case of Stephen, inquiry in the case of James -- can be purely abstract; they both insist that the passions play an important and ineliminable role in guidance of their respective fields of discussion, and in some ways the important role; they are both insisting on what today would be called naturalizing the fields in question -- they are taking some normative principle held by their respective proponents on purely abstract principles and insisting on subordinating it to psychological facts; they both insist on the importance of action to our beliefs. Ozzie and Harriet Nelson are easily in the running for being the king and queen of situation comedy. Their radio sitcom was a major fixture from 1944 to 1954 and was one of the radio shows that easily made the transition to television, where it ran from 1952 to 1966, making them, as their tagline always was, "America's Favorite Family". The first few years on radio their children were played by various actors, but eventually David and Ricky Nelson began playing themselves; and the television show eventually show launched Ricky Nelson's music career as a teen idol. The basic premise of the show was modern suburban family life, with lots of humor, but always put in a positive light; it was intended to be a comic, rose-colored-glasses version of the Nelsons' own family life. It was such a major fixture that many of the aspects of sitcoms that we regard as formulaic or cliched were developed by the show and just became standard. Great situation comedies tend to be characterized by consistently OK or good episodes rather than by any particularly great episodes. But sometimes special-occasion episodes do stand out as both combining the basic features of the series and doing something a little different with them. The "Easter Sunrise Service" episode (also just known as the "Easter Show"), from April 1949, is an example; Easter-themed classic radio episodes were not very common, unlike Christmas episodes, which would have made it a rare treat -- and it was actually a relatively popular episode in part because of this. It also captures a lot of the rather lighthearted and easygoing humor of the series, and it's late enough that the entire Nelson femily is on the cast. You can listen to the show online at My Old Radio.